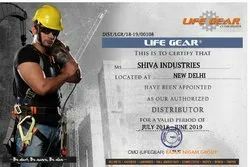 We, the group of Shiva Industries take immense pride in introducing ourselves as a prominent manufacturing and supplying organization of Industrial Safety Products. We have been serving the nation with our quality products since 1992. We use premium quality raw materials and advanced technologies to manufacture our range. In order to provide utmost security and efficient performance our team of engineers and experts test and verify the products range starting from the procurement of raw materials till final dispatch. With various dimensions and specifications these products are available at cost competitive price. We also offer the facility of customizing the products according to the users approach. 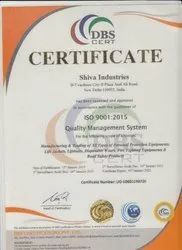 Located in Delhi, we are led by the valuable guidelines of “Mr. Sanjeev Kapoor” whose extensive domain experience and positive team spirit helped us to achieve growth rate in these years. To assist him, we also have a team of dedicated and experienced industrial designers, quality checking experts and other supporting staff to monitor the entire production process. Furthermore, our approach towards ethical business practices helps us to remain ahead of our competitors in this industry. In addition, we are committed to forge long term relationship with our clients by serving them the qualitative products as per their specifications. With sophisticated manufacturing unit and team of engineers & experts we are capable of manufacturing qualitative range of products in a bulk. Apart from this, timely delivery of our consignments available at reasonable price helps in achieving recognition in the market. Since, we posses a client centric approach, our prime focus is to provide qualitative range of finished products in timely delivery. Based on the customers’ requirements, we manufacture our range. We maintain a healthy relationship with our customers which help us to properly understand the customers’ requirements. Due to the competitive price of our products we have created a large client base across the globe. We are dealing with manufacturing a qualitative range of industrial safety products. With skin friendliness and flame resistance these products provides complete safety. Made of premium quality raw materials our produced range is developed for the industrial workers and medical staffs. Since we derive a range of safety products for mankind, our products find a wide application areas over the industries. With utmost safety our offered ranges are available at cost competitive price which meet the clients requirements absolutely. Made of premium quality raw materials these products are skin friendly hence are widely used in various construction industries, power plants, chemical industries and others. Our organization is a good combination of proficient engineers, quality checking experts, marketing experts and financial administrators having in-depth knowledge and expertise in their field. With hands-on experience in respective domains they execute their duties of financial management, production, quality controlling and packaging. Our engineers indulge themselves in making innovative range of security products to meet the customers’ requirements and achieve maximum clients’ satisfaction.